I hope to use this platform to highlight some of the really compelling cries for help in my community, and really inspiring responses. We can’t do everything, but we can always do something. The P Strong foundation was created by friends of Pattie Iannitti after she was diagnosed with a rare abdominal cancer. The foundation raises money for research into better treatment options for those battling rare and unusual cancers. For more information about P Strong, or to make a gift, please click here. It was my honor to share the story of Pattie, and of my friend Sheri, in a series called Because Friends that appeared on MomsCharlotte/Charlotte.com — and to celebrate how friends rally to support one another during crisis in mid-life. I flip through my calendar, which is the first indication that I am middle aged. While my iPhone is starting to feel like an appendage and I am happy to send a retweet or two, I just cannot give up the comfort of touching the real pages of my paper calendar. The ability to write in pencil the possible things and in blue ink the for sure things seems comforting in a way that is hard to explain. I once heard that you can learn what someone holds dear by looking at their checkbook (another relic? ), the money trail a reflection of their values. I think the same could be said for how you spend your time. Want to know what is important? Check out the daily planner. What fills mine is the second indication that I am in middle age. It is mostly stuff for the kids: the spring music concert and school play, sports’ practices and games; also the church fundraiser, family birthdays, dentist appointments. But there is one special marked day that stands out above the rest: Friday, March 28th, the night of the Bal Masque′ party benefitting the PStrong Foundation. The foundation inspired by my friend Pattie, created to fund research to discover better treatment options and to develop cures for rare and unusual cancers. Pattie and I wrote a blog together for our friend, Sheri, after she was diagnosed with a rare abdominal cancer. After somewhat unremarkable but persistent symptoms led to an overwhelmingly remarkable whirlwind of surgery and a diagnosis of peritoneal cancer, we partnered to keep folks in touch with Sheri’s situation. Pattie, with her nursing background, understood medical details and deftly authored the most comprehensive updates. And Pattie, with her writing background, also created the design of the blog, and posted clinical reads full of difficult information. My posts were less useful to the larger information-sharing goal; I only hoped that they would make Sheri smile if she read them. Because smiling and laughing is what Sheri does best . . . how many times had I shared a laugh with both of these ladies, social friends connected by our husbands who are all surgeons with Carolinas Healthcare System? We enjoyed a similar sensibility as women with strong personalities married to partners with big jobs. Surgeons fix problems – or at least try to – and the problems are often huge, as is the lingo: laparoscopic bariatric surgery, solid organ nephrectomy, minimally invasive endoscopy, microwave ablation. As former nurses, Pattie and Sheri spoke that second language in a way that I could not, but they never made me feel inferior or out of the loop. We found a lot of common ground, in the things that interested us and that made us laugh and we bonded over the shared suspicion that behind every good surgeon is someone on the home front tempering the Type A. Some friends come your way because you seek them out; some are put in your path and are an unexpected gift. When I became friends with Pattie and Sheri, all I knew was that they were both interesting, smart women with whom I always felt a grateful affinity, like when Pattie and I were dressed almost identically at the dinner where we first met, or when Sheri helped me when I was felled by a stomach bug moments before guests were to arrive at my house for a 4th of July party. They are the type of friends that show up. This reminds me of the cake at Sheri’s house for the pre-chemo party she had before starting treatment. 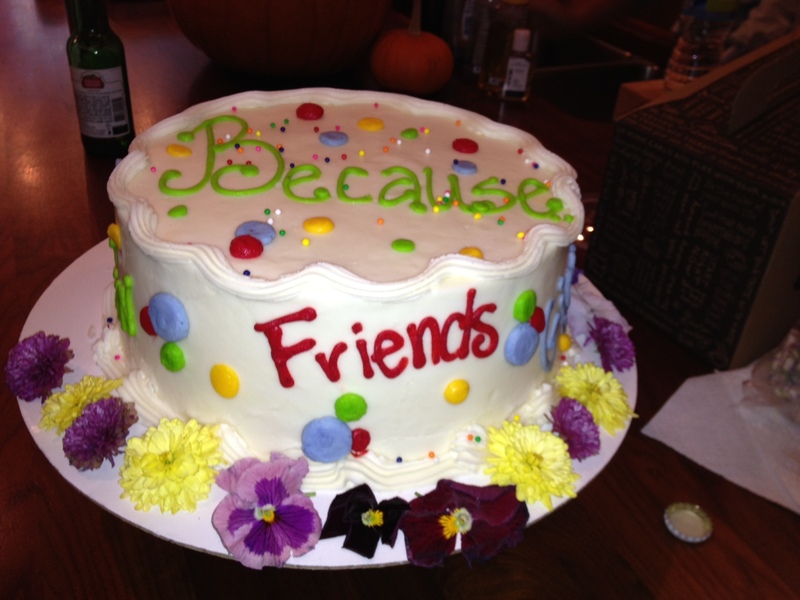 I took a picture of the cake turned just so, the bright decoration revealing the words BECAUSE FRIENDS. Because there is so much you cannot control in life, and the older you get the more you experience that reality. Because the mundane days on your calendar may be replaced with a tsunami of life-seeking struggles in the blink of an eye; things that were once rare and unusual, remote dark possibilities become suddenly realized fully by those who find themselves fighting to reclaim the ordinary. That even when it seems the earth has stopped its cheerful turns and is instead like a needle skipping on a broken record, stuck on the winter solstice, too cold and with not enough light, that even then you can find relief and healing and lasting goodness through the actions of those around you. Because friends are a constant joy in a world of random heartbreak. So on Friday March 28th I know I will be laughing and dancing with Sheri and with Pattie, but this story starts before then: before the creation of the PStrong board on which Sheri serves, before Pattie’s diagnosis and surgery, before PStrong charms and Blue Mondays. I flip the calendar backwards and note for all the tumult, the parts that are ongoing, and so much that is unknown, that there is always the space for the pencil and the pen – all that can be recorded as possible, and those things we do know for sure. The shock of hearing that my friend Sheri was facing a health crisis was interlaced with the shame of having spent a full five minutes on the telephone complaining about rush hour traffic before my husband could get a word in edgewise. He was attending a medical conference and I assumed he had called just to check in. But this was not an inconsequential conversation. He told me that Sheri had received shocking news at a doctor’s appointment; that he had helped to get her husband Keith, also at the meeting, checked out of the hotel and onto a plane. Surgery was required and would happen very soon, the first week of October. I reached out to Sheri and to other mutual friends. I struggled to wrap my brain around what was happening. It felt surreal to hear the happy shrieking of kids playing behind me while I huddled in a corner of the soccer fields, frantically trying to get updates about what was going on. The surgery was extensive. Afterwards when I went to the hospital to visit I saw Deborah and I knew she had spent the first of many nights with Sheri. I could see the difference it made to have the support of friends like her around, the comfort of normal chatter and silly banter. Sheri’s spirits were clearly lifted by Deborah, and by Tyson, and Angie, and her cousin Timmy. Visits from Brianna and Sue and many others countered the discomforting diagnosis of peritoneal cancer. How I wanted to be part of something that would mitigate my friend’s pain! Everything I could think of seemed so inadequate, but I tried to let what I knew to be true about Sheri guide me. I once said that if Chelsea Handler and David Sedaris had a baby, it would be Sheri. So I came to the hospital armed with the book Awkward Family Photos, and eventually included a personal awkward childhood photo for good measure. Sheri had always made me laugh and I was determined to repay that gift if I could. And I offered to write a blog or website to keep folks informed of what was going on. Unbeknownst to me, Pattie volunteered to do the same thing. I knew that Pattie enjoyed writing and had maintained a blog before. We had discussed our shared interest many times and I was very glad that we could connect as partners to provide updates about Sheri. In an early message on the blog, Sheri wrote, “I am the luckiest girl in the world to have such amazing friends and family! I know this is not going to be easy, but you all have lifted me up so much that I know I can do this!” She readied herself for treatment with a pre-chemo party at her house complete with a bouncy house for the kids. I watched her boys jump happily with mine. She served the BECAUSE FRIENDS cake and showed off her sassy nails, painted in the color officially designated “peritoneal blue.” She seemed strong and determined. I was in awe of my friend. If I met Sheri’s cancer on the street I would spit in its face. I would go all Quentin Tarantino and the revenge would be epic . . . If I passed Sheri’s cancer on the highway I would gun it to about 200 miles an hour, cross over the lines in full traffic and slam on my brakes right in front of that loser. I would eject out of my sun roof right before the fiery crash, the big C reduced to a million shards of shattering glass and twisted metal just as I land safely at the Dean and Deluca wine bar to buy Sheri a glass of red. We would toast the amazing sunset that had “somehow” appeared in the distance, the blazing yellows and oranges lighting the sky over the Brookshire Freeway. Even on the hard days, though, there was compelling evidence of empowerment and support to be found: the “heart yard” that transformed her front landscape with tons of hearts poking out of the grass; the shaved head of a friend in solidarity; the “peritoneal posse” of Todd, who had assisted in her difficult surgery, Angie and Greg, Keith, and later Deborah accompanying Sheri to Sloan Kettering in New York and returning armed with an improved chemo experience and a plan in the event of recurrence. This was as important as anything else. Somehow we got to talking about the positive things that come from cancer – a topic that Sheri introduced to my amazement. She talked about all the ways that she felt good – maybe better than before. She talked about her superstar family, how everyone had figured out how this was all going to work: when someone had to go another relative would come to lend a hand, ensuring that the help was seamless. She talked about how much she appreciated all of the support from friends: being there for her, helping with food, picking up the kids, checking in. She said that all of that effort underscoring her fight was an amazing gift – that with all of this, all she had to do was concentrate on getting better. All. Just battle the cancer part. Still, I did understand what she was saying. By March, Sheri had finished her treatments. I wrote a blog titled The “Rights” Of Spring, because it seemed a lot finally was going as it should. This was one of my last regular reports. In May, Pattie posted over twenty entries online. Only Pattie’s updates weren’t on Sheri’s blog. They were on her own Caringbridge website. When I think of my friend Sheri, I picture this amazing photo she texted to me last summer. When I first saw it, I wondered if it was Pink’s new CD cover image. But no, it was Sheri. On a pier in a billowing white dress. CATCHING A SHARK! I did a triple-take when I saw it. In retrospect, though, this scene seems pretty apropos given what Sheri faced in the year leading up to that picture. She looked larger than life – and in reality proved larger than what life had dealt her with her diagnosis. All the ways she was unique and wonderful became more pronounced that year. There are some things cancer takes away but many important things refuse to be diminished. When I think of my friend Pattie, several things come to mind. I think of the theme she chose for Sheri’s blog, Choosing Sunshine, and how she chose sunshine when her turn came, courageously sharing her experience with us all. I think of the day I tried to text her and my crazy auto-correct changed her name to Party!, suggesting that maybe there is a method to its madness when it manipulates what you type. And I think of her in a beautiful blue ball gown at the P Strong Bal Masque gala last Friday, glowing and happy, reflecting upon her experience over the past year and thanking the many guests there for supporting the P Strong Foundation. Over $100,000 was raised through that inaugural event to support research into better treatment options for rare and unusual cancers. The energy of that evening was electric . . . so much laughter, dancing, and celebration. Sometimes life hands us a challenge we never expected or wanted. Our carefully constructed plans disintegrate before our eyes – the every day tasks that defined us are ripped away, and previously mundane, ordinary moments become priceless and elusive gifts. I have learned that while the comfort of every day life is not guaranteed and may disappear in a moment, often what remains is profound – surprising strength, resilient hope, and inspired action. Because friends are love made tangible: in food prepared, messages sent, thoughtful gifts shared, masks donned and masks pulled away. My head spins with images of ball gowns and shark bait, and it is all good . . . because my friends make it so.